If developed, Hilcorp's Liberty project, would be the first in U.S. federal offshore oil produced in the Arctic. A federal agency has granted its blessing to Hilcorp Energy Company’s plan of development for what would be the first producing oil field located entirely in federal waters off Alaska. 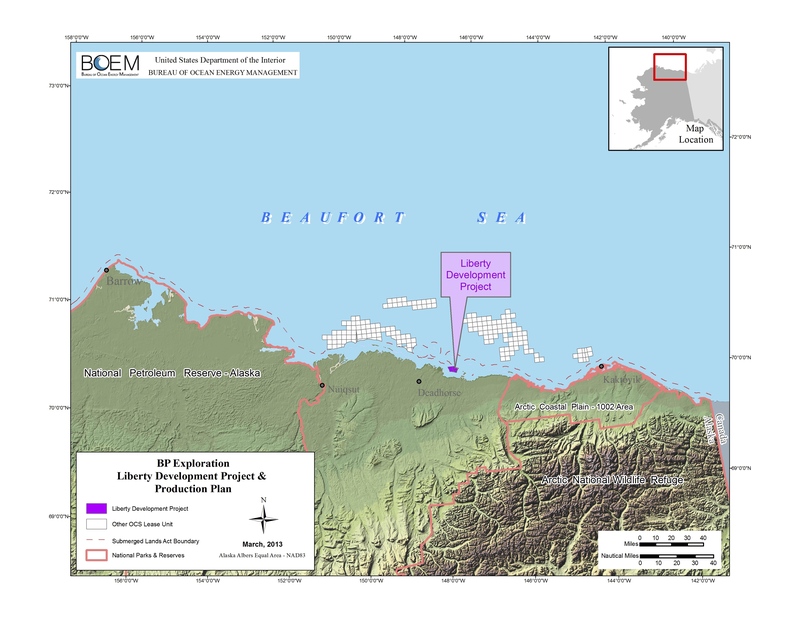 The U.S. Bureau of Ocean Energy Management on Thursday released a final environmental impact statement that endorsed Hilcorp Alaska LLC’s plan to produce oil from the Liberty field from an artificial gravel island constructed in the Beaufort Sea. Hilcorp’s plan of development is the third submitted for Liberty, a field with an estimated 150 million barrels of recoverable oil. The prospect is about five miles offshore, putting it just past the limit of state territory, and about 20 miles east of Prudhoe Bay. If Liberty is developed, it would mark a milestone. Although there have been several discoveries of oil in federal waters off Alaska, there has never been a producing oil field located entirely in the federal outer continental shelf area. Hilcorp estimates that Liberty will provide 60,000 to 70,000 barrels per day at peak production, and that the field will be in production for 15 to 20 years. The plan for development includes an artificial island in water about 19 feet deep to hold all drilling and production, with a pipeline through the Beaufort Sea to tie into existing pipeline infrastructure. The island would hold a little over 9 acres of work surface and a total footprint of about 24 acres built in waters on the sea floor. Four other North Slope fields already use such artificial islands, the final EIS notes. Hilcorp submitted its development plan to BOEM in 2015. That plan emerged as the preferred alternative after a draft EIS was published last year and after the agency held public hearings in the Beaufort Sea communities of Utqiagvik and Nuiqsut and the cities of Anchorage and Fairbanks. “This Final EIS incorporates input from those communities and the comments we received from other stakeholders, partner agencies and the general public. With that input, our scientists have produced a robust analysis that thoroughly analyzes the potential impacts of Hilcorp’s proposal, BOEM Acting Director Walter Cruickshank said in a statement. A major concern about Liberty development is potential impacts to the nearby Stefansson Sound Boulder Patch, a biological hotspot rich with kelp. BOEM considered some alternatives that would have routed Liberty’s production island farther away from the boulder patch, but ultimately rejected them as not feasible. One of those alternatives would have put the island about a mile to the east, and thus more distant from the most concentrated part of the boulder patch, but that would have required an additional 0.25 miles of pipeline that would be almost certainly at risk of “overflood occurrence,” making that section vulnerable to wear and buckling, BOEM said in the final EIS. The second of the boulder-patch-avoidance alternatives would have put the island about 1.5 miles closer to shore — into state territory — but that would have resulted in a need to drill much longer well bores of about 17,200 feet instead of the planned 13,900 feet length, the final EIS said. Although oil in the area was first found in the 1980s and Liberty’s resources have long been known, the prospect has languished for many years. Previous development plans submitted were submitted by BP in 1998 and 2007, but the company abandoned both. In 2014, in the aftermath of the Deepwater Horizon disaster, BP sold several North Slop assets to Hilcorp, including a half share in Liberty, and Hilcorp became the prospect’s operator. BP’s initial development plan proposed an artificial island, but the company withdrew that plan after a similar island at the Northstar field proved costlier than the company had expected. BP’s second plan for development proposed to use ultra-extended-reach wells to drill into Liberty oil from shore, a proposal that would have avoided the need for any island. A similar for ultra-extended-reach drilling was considered in the latest EIS as a development alternative, but it was rejected by BOEM.